Malacca has always captured my heart. It is a quaint city with a long and rich historical heritage. Those of us who paid attention in school will remember that Parameswara, a Hindu prince from Palembang fled Temasek (Singapore’s ancient name) in the 1400s and founded Malacca. He named the city after the Melaka tree. Its strategic position on the trade route linkng China, India and Europe soon attracted covetous foreign powers. Admiral Cheng Ho made Malacca his logistical base for his numerous trade journeys. In 1511, Alfonso d' Albuquerque led his Portuguese Naval fleet to capture Malacca and built A’Formosa Fort. The Dutch was next and established themselves in the 1600s, leaving their mark with the famous red Stadhuys (Town Hall).. The last colonial power that took over was the British in the 1800s. 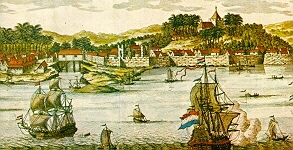 The Anglo Dutch Treaty of 1824 ceded Malacca to the British, while the Dutch gained Bencoolen in Sumatra. So much for history, fast forward to 2006! 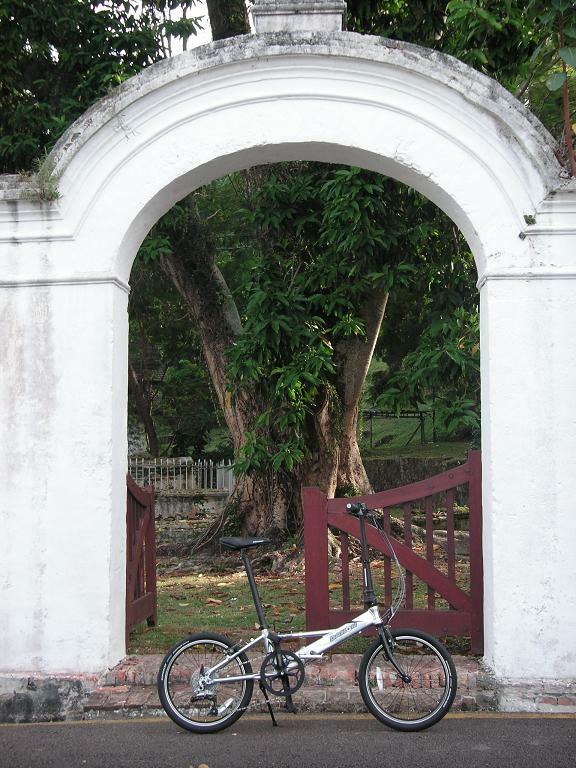 What is intriguing is that historical evidence of these significant moments still exists in various parts of Malacca and the best way to experience and explore them is by bicycle -folding bicycle to be precise. The plan was to go up by car, discover the city by bike and return by train. 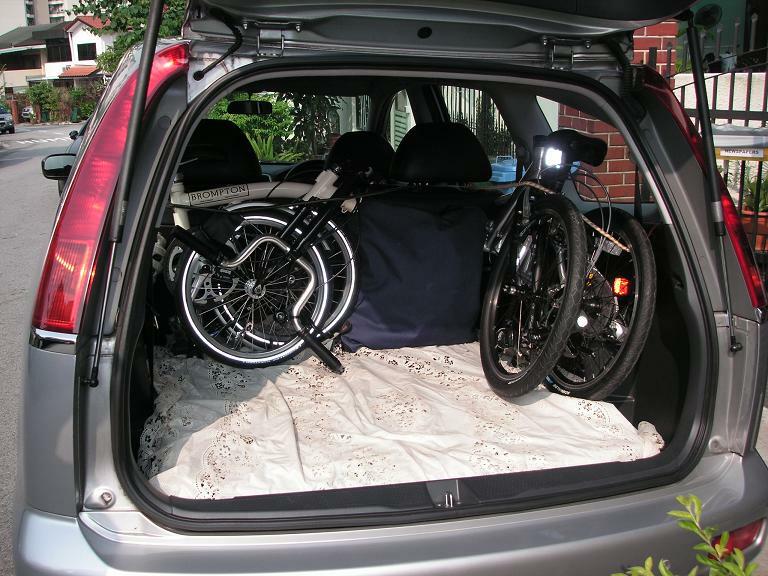 This could only be accomplished with a folding bicycle - no need for a clumsy bicycle rack, we would have ease of storage and security in tight hotel rooms, and enjoy the convenience of taking the bikes on board the train home (we hoped). Traveling up by car with my brother, his wife, 5-year-old daughter and my burly Australian relative, Paul, made luggage space a premium but the 2 foldables took up surprisingly little space. The 3 hour drive was easy enough. 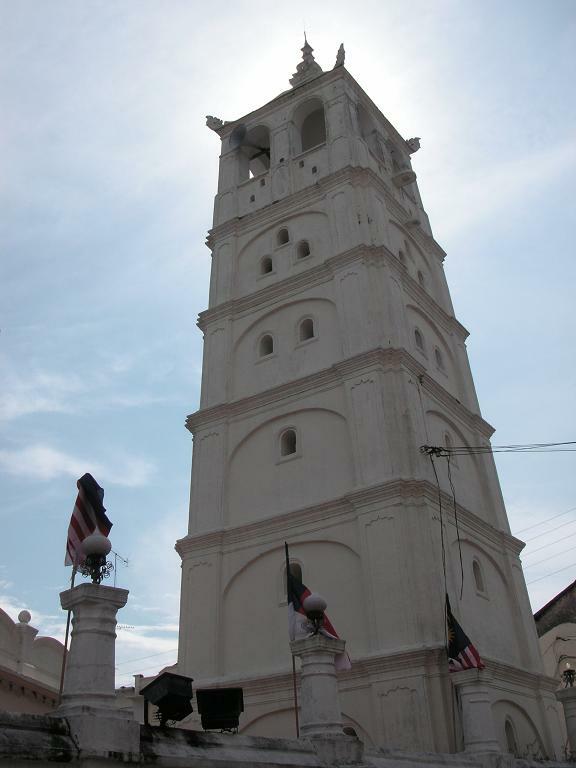 On arrival, we started exploring the sights of Malacca straightaway. Jonker’s Walk is probably the best place to start if one is keen on curios and antiquities as the street is lined with such shops. The cultural mix of different peoples and religions is played out before our eyes. 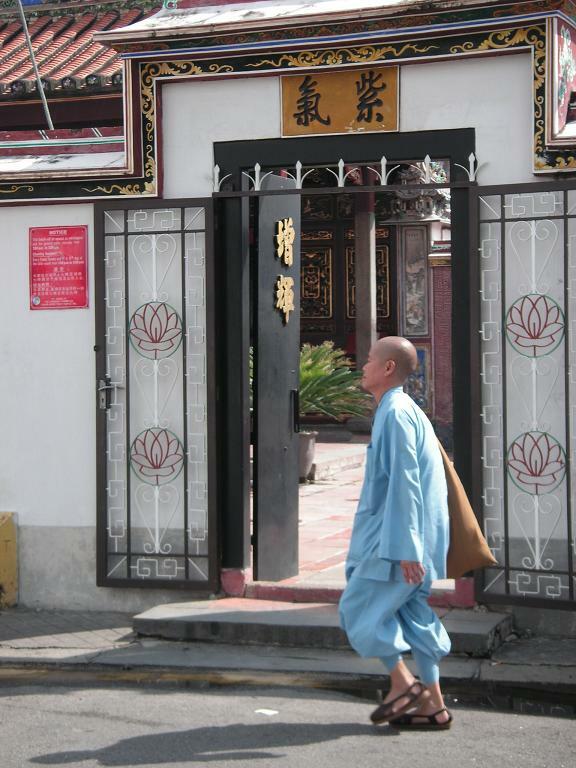 On the same street, a Hindu temple, Cheng Hoon temple and Tengkera Mosque sit contentedly alongside one another long before any Religious Harmony Bill was enacted. 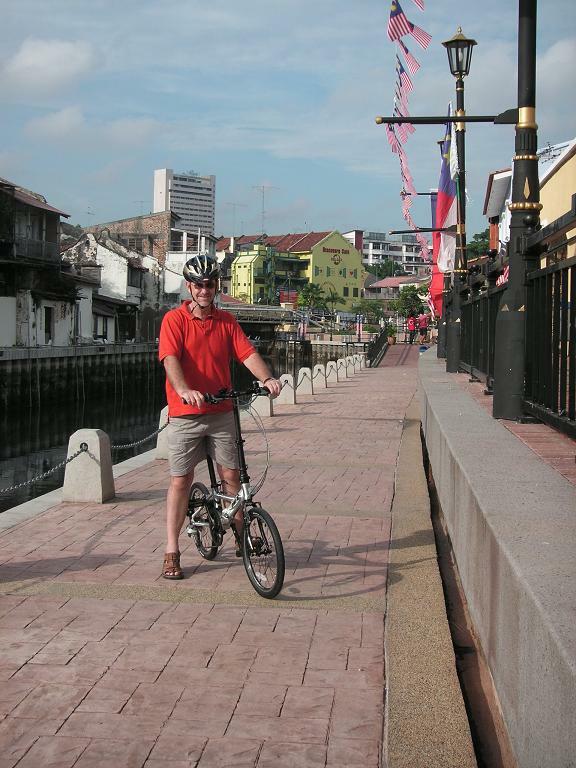 Next stop was the Malaccan River where the city’s life began so many centuries ago. Today, the river still brings in people from Sumatra across the Straits on daily ferries and its good to know that the authorities are restoring the riverside area very much like our Clarke Quay in Singapore, with exciting bistros and restaurants sprouting up. There is a river tour every evening at six pm that is worth signing up for as the Portuguese tour guide sure can tell a tale or two about what was and what is to be. Apparently, the real residents of the river are dinosaur-looking monitor lizards that live in the cracks of the river walls. They had names after Hollywood stars like Bruce Willis and Michael J! 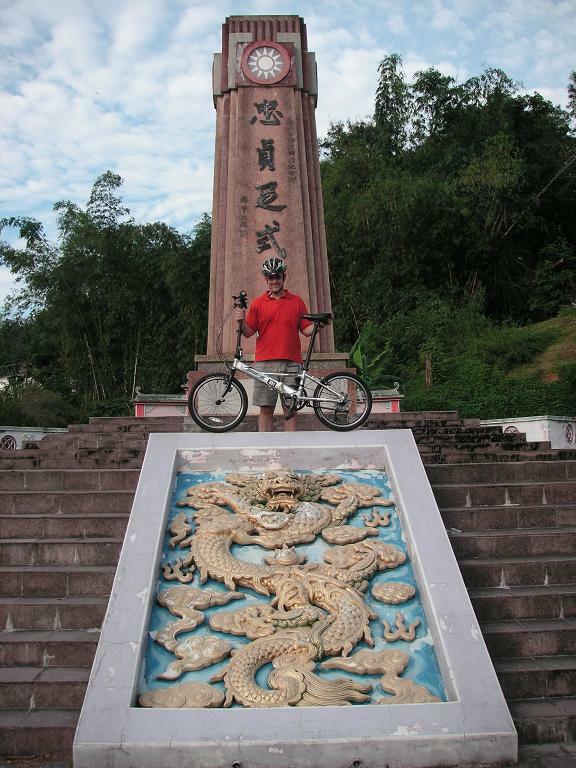 A visit to the Dutch Stadhuys area is a must as this represents the epicenter of Malaccan history. Christ Church built in 1753 is still used for services every Sunday. I was thrilled to discover a plaque commemorating Queen Victoria’s Diamond Jubilee (1837-97) nearby. This is also where all the gaudy decorated trishaws hung around, baiting for their next customers yelling, “Trishaw? Vely cheap!” But I had my own set of wheels! We rode along a small alley behind the Stadhuys area and discovered to our delight a small Dutch graveyard that had about 15 or so tombstones. It was fascinating to read the inscriptions of people who had lived and died in Malacca 300 years ago. They were mostly military officers, high-ranking officials and their families who lay peacefully there. I wonder if their descendents today know of their final resting place. Being Peranakan or Straits-born, revisiting my historical roots meant a lot to me as I never saw my ancestral homeland as China but here in Malacca. We went looking for the Chinese heritage markers of Malacca. Bukit China is where graves dating back to the 16 th century can still be seen, though many have been exhumed. A more recent monument to remember the fallen Chinese of World War 2 stands prominently here. It was distressing to read about the atrocities committed by the Japanese army. Stories told to me by my late grandparents came alive and to think all these happened within living memory! The culmination of Malacca’s rich history and culture is best evidenced in its cuisine. No one should leave this place without savouring its unique foods. Problem is, one is spoilt for choice with so many restaurants offering so many different types of Malaccan gastronomical delights. We settled on the Bulldog Café and the decision was made because of its appealing décor - namely a bicycle displayed brilliantly upon a wall. As it turned out, the Nonya food we ordered was excellent and we ate heartily, carbo-loading in preparation for our early morning 40km ride to Tampin Train Station. Busting at the seams, we went for an after dinner walk back to the Jonker’s area to find a surprisingly bustling night-life. 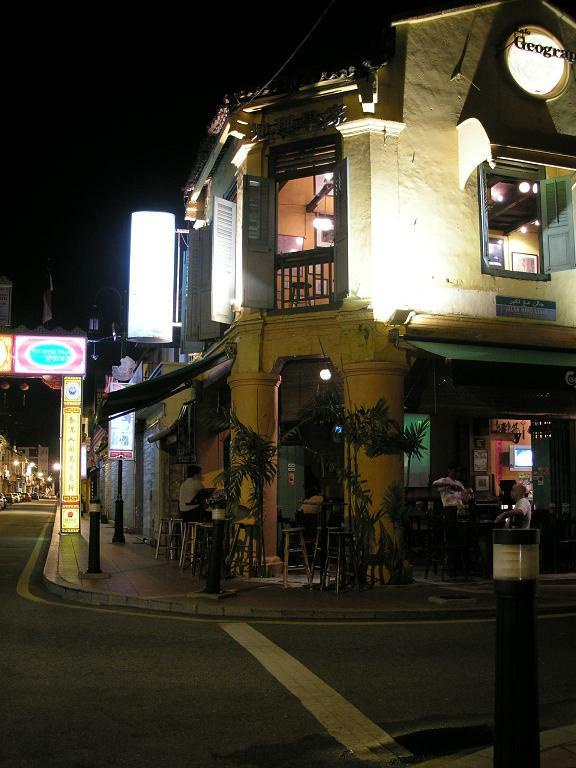 The Geographer Café is a lovely sidewalk watering hole that attracted many backpackers like moths. Paul and I had a Tiger there, watching the Corrs, an Irish girl band, on big screen TV and just soaking in the relaxing atmosphere. I wondered if there were such places when the Europeans of old were here drinking their rum and whisky. With all the excitement of the day and the need to set off at 0615, we did not sleep very well. The alarm finally rang and we were glad to be on our bikes once again on the quiet streets of Malacca in the cool, crisp morning air. Paul was on my new Dahon Helios and was riding briskly at about 25-30kmh. I had to call on all of the 6 speed gearing on my slower British Brompton to keep up. In the end, I figured the best way to slow down the Australian steed was to swap bikes. This made our pace more compatible. is a divine and spiritual experience. It was lovely to see the morning life unfolding before us as we rode out of Malacca - children getting to school in their neat uniforms, four snugly on a Honda Cub, others waiting for the bus or walking, roosters doing their thing and coffee shops opening up for their first customers. The roads soon became nasty with long hills which drained our energy quickly. We were surprised at how much ground we covered. At our first rest stop, a simple road-side Malay eatery, it was encouraging to know we were only 12km from the train station. With the welcome intake of a very average Teh-Tarik, Nasi Lemak and Mee Goreng breakfast, we found our second wind. As we veered onto a minor road towards Tampin, the scenery changed accordingly - with plenty of Malaccan-style pointed roofed houses, wide fields and some old factories. We rode passed an overturned Proton car, pitifully in a drain. The busy policemen taking photos and measuring skid marks were oblivious to two curious cyclists on ‘circus’ bikes. We made it to the train station at 0855 with plenty of time to spare. The ticket booth was not open till 0930 and our folding bicycles attracted a lot of unwanted attention from the Station staff. They looked at us disapprovingly as bicycles are strictly not allowed in passenger carriages . But as they saw us doing an origami miracle and making our bicycle disappear into our bags, a river of friendly bantering flowed. 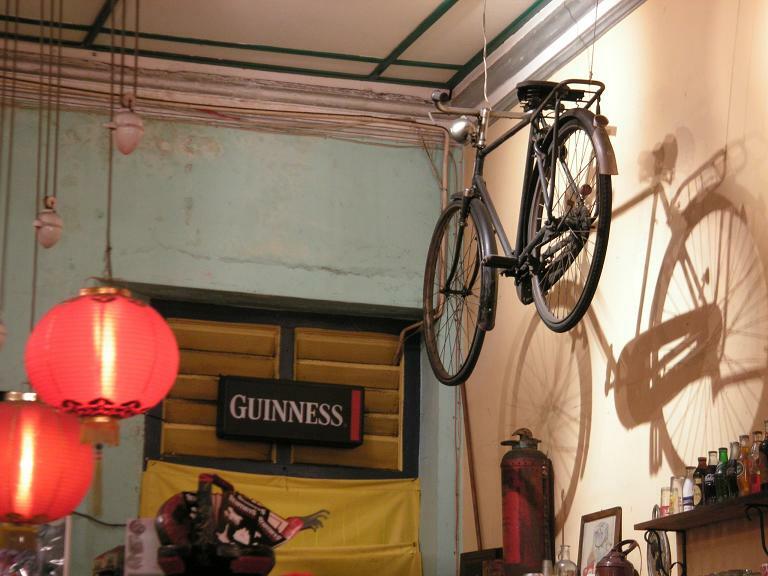 A young Malay engineer remarked, “Wa, you cycled from Melaka? Very far la!” and started unloading his life story to us as if we were his kampong buddies. It was cold comfort to learn that the train derailed just 48 hrs ago. The engineer’s assurance that it has been fixed did not help. The 1029 train arrived punctually. 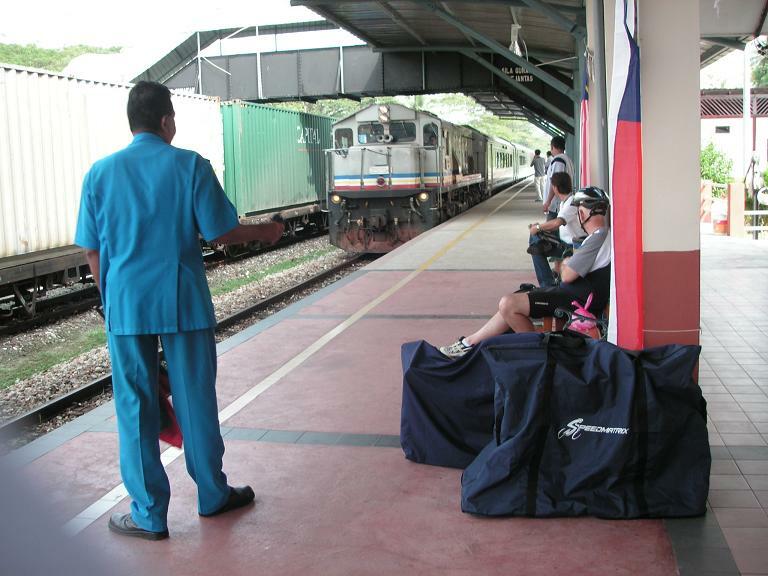 We were ushered into our first class carriage, settled comfortably into plush seats and our bagged bicycles safely stored. Paul and I headed home to Singapore feeling very accomplished and satisfied. 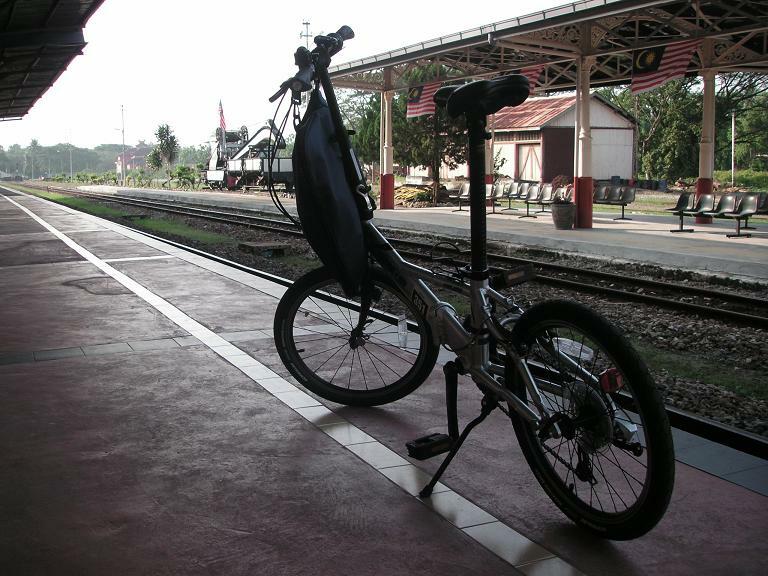 We rode through history and perhaps made a small contribution to local bicycle history, by bringing one of the first folding bicycles on board the 121-year-old colonial Malayan Railways. 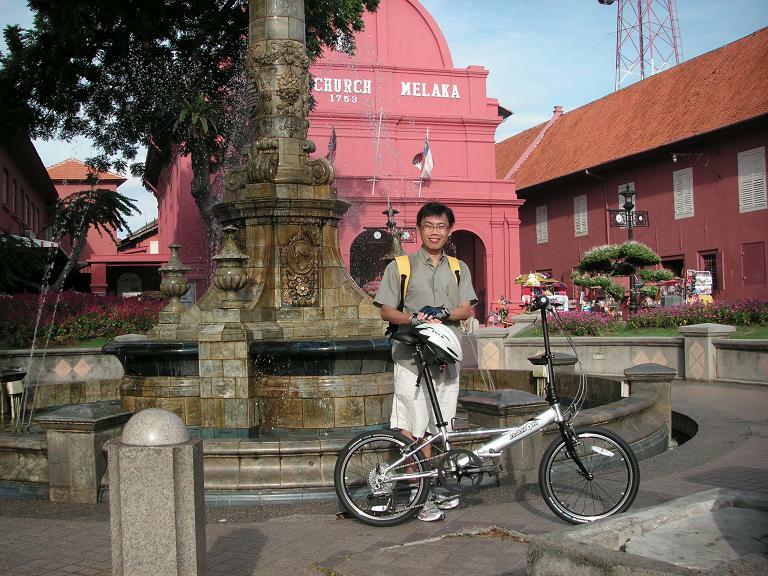 Alvin Lee presently lives in Singapore and enjoys eco-travelling preferably on folding bicycles. Educated in ACS and studied business & management in the US & Australia, he worked in the car industry and education. Presently, he volunteers in a non-profit organization when he is not on the saddle.